10,000 rioters throw grenades and rocks at IDF soldiers. In Judea and Samaria, IDF forces eliminate rock-throwing terrorist. The violent riots along the Gaza border continued on Friday, as the IDF deployed in large numbers after Hamas threatened to “immediately retaliate” to an Israeli “aggression”. 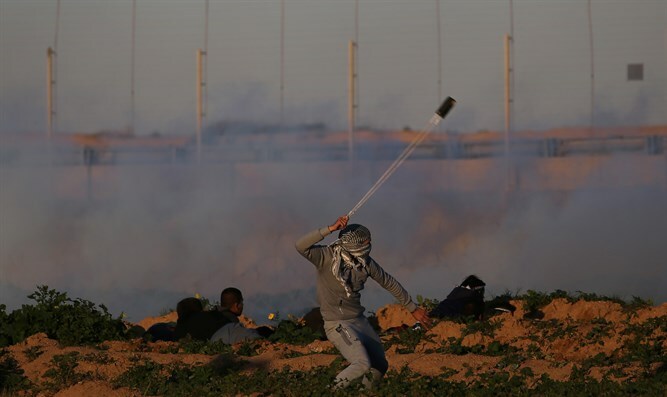 The IDF said that 10,000 rioters gathered at a number of locations along the border fence, throwing grenades and rocks at IDF soldiers and at the fence. In addition, two grenades were thrown at an army vehicle in northern Gaza. There were no injuries or damages. A number of explosions were observed in the Gaza Strip during the riots, in which a number of Palestinian Arabs were injured, according to the IDF Spokesperson’s Unit. IDF soldiers responded by riot dispersal means and firing in accordance with the rules of engagement. The Hamas-run Gaza “health ministry” said one of the rioters was shot dead by Israeli fire. The border riots have been occurring every week since March 30, but Friday’s riots were the first since Hamas rejected the latest installment of Qatari money to Gaza. Meanwhile in Judea and Samaria, IDF troops fired at three Arabs who threw rocks at Israeli vehicles traveling on Highway 60 near the village of Silwad, north of Ofra. The three suspects received medical treatment at the scene by IDF forces. One of them died of his injuries and another was wounded. The incident is under investigation.